Teriyaki Chicken doesn’t gets any easier then this folks! Seasoned chicken wings are baked in a marinade creating some amazingly tender & delicious teriyaki chicken wings! And I really mean it! 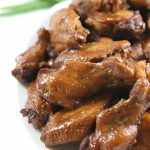 After trying these Teriyaki Chicken Wings at a baby shower and finding out how easy they were to make, this recipe was on my to-make list. Mr.Yoshida’s marinade & cooking sauce can be found at Coscto and can be used for multiple things. I’m curious to know what other tasty recipes turn out from this marinade so please feel free to comment me below:) Make this Easy Teriyaki Chicken Recipe to see how seriously amazing these wings really are. 2. Pour 1 cup of Mr. Yoshida’s sauce over the wings and marinade for at least one hour. 3. Preheat oven to 400 degrees F. Cover wings with aluminum foil and bake for 1 hr. Reduce temperature to 350 degrees F and continue to bake for an additional 2 hrs, turning to coat wings every hour. Teriyaki Chicken doesn't gets any easier then this folks! Seasoned chicken wings are baked in a marinade creating some amazingly tender & delicious teriyaki chicken wings! And I really mean it! Place thawed wings single layered into a large baking dish and season with salt & pepper to taste. Pour 1 cup of Mr. Yoshida's sauce over the wings and marinade for at least one hour. Preheat oven to 400 degrees F. Cover wings with aluminum foil and bake for 1 hr. Reduce temperature to 350 degrees F and continue to bake covered for an additional 2 hrs, turning to coat wings every hour.